Since the release of his 2012 debut album Up All Night, Kip Moore has established himself as a favourite on the live circuit both here and in the US. The charismatic singer-songwriter released his third album Slowheart in 2017 and he’s been very committed to performing live here in the UK. Earlier this year Moore performed at C2C: Country to Country for a second time and he’s already announced he’ll be back in the UK in 2019 with his Room to Spare tour. Moore has recently released a new EP of the same name, featuring 7 tracks. 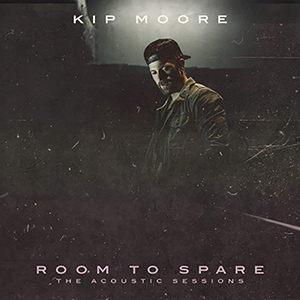 Room to Spare: The Acoustic Sessions came to be after fans pretty much begged Moore to release an acoustic album. This may not be quite album length but with 7 songs it’s definitely more of a treat than a standard EP. Room to Spare opens with an acoustic version of Slowheart opener Plead the Fifth. In acoustic form, the song loses none of its magic and actually sounds a little closer to the Springsteen inspiration that was likely behind it. Moore’s husky yet soulful voice sounds magnificent in an acoustic setting and I’m already feeling excited about his tour in support of this release next year. The other six tracks on the EP are new tracks starting with Tennessee Boy. The familiar beat is true to Moore’s signature sound and the track builds slowly. It actually takes a full minute until the chorus kicks in and it has that sing-a-long quality that makes Moore’s music so memorable. Next up is Love You to the Moon, a track co-written by Charlie Worsham who Moore has been touring with. Worsham has been performing the track himself but Moore’s version if an altogether different beast. It’s one of those moments you can’t quite imagine working but it does. It also moves Moore sonically into new areas and it’s one of the highlights here. Worsham pops up for another co-write, this time with Moore on It Ain’t California. Marrying Country with Moore’s distinctive rock edge, the song really showcases Moore’s voice. That gruff edge he has as he unleashes his power is spine-tingling and it’s present throughout the track. Elsewhere Wish It Was Me is a shimmering moment of acoustic rock and Come Home With You is a gorgeous ballad that shows off Moore’s more romantic side. Things come to a close with the gentle and folksy Part of Growing Up. It’s nice to hear Moore’s sensitive side coming out more and this is one song I can’t wait to hear live. Room to Spare: The Acoustic Sessions EP is exactly what Moore’s fans want from him. He’s an artist that doesn’t need a full band and lots of production to sound good. Give him an acoustic session and he’s in his element. The more stripped-down sound definitely suits him and the 2019 UK tour is going to be really special. I wouldn’t be mad if he continued to explore this sound more on his upcoming fourth album.